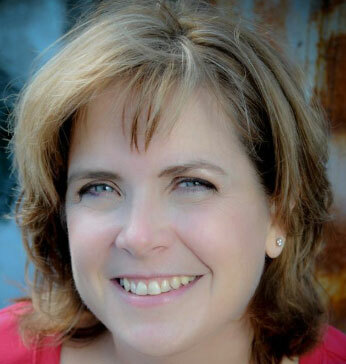 Visit her at GenevieveGraham.com or on Twitter @GenGrahamAuthor. 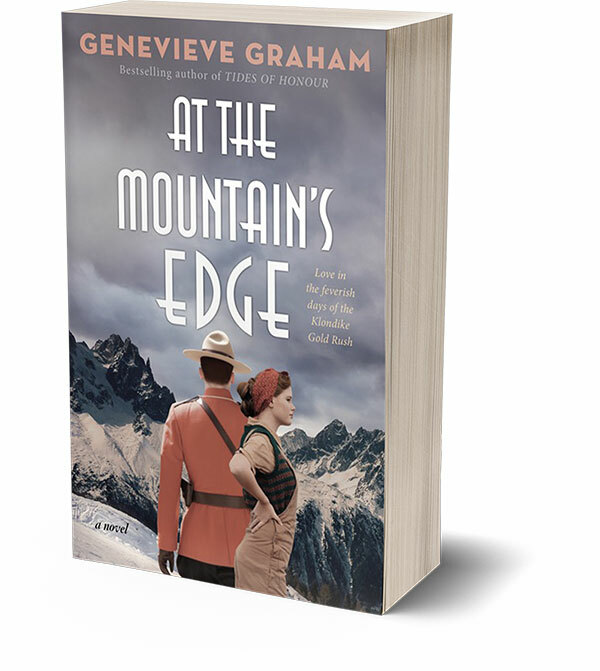 What period is your new book At the Mountain’s Edge set in? At the Mountain’s Edge stretches between 1897 and 1903, not including back stories! The book is about the Klondike Gold Rush, correct? How did you do the majority of your research? Have you visited Dawson City? My research is always done using all different input, from books to websites to videos and movies, and though it sometimes seems pretty scattered, it makes sense to me. The only thing I don’t do is read other people’s historical fiction novels set in that time period. I need to see the story through my eyes and not be influenced by anyone else’s perspective. In order for me to write real, compelling historical fiction, I research and write in three steps. The first thing I do is teach myself the basics of the time period and the event on which I’m focusing. For example, I needed to know what the Klondike Gold Rush was and where it had taken place. When I started, I didn’t even know that monumental event had happened in Canada. The truth is, I have never been a historian, so when I write I am teaching myself at the same time as I’m creating the story. So, to learn the basics, I always start at the library—they know what I’m working on before anyone else ever does—and I start to browse online. The second step is for me to learn about the people and culture of the time period I’m studying. I need to know all about the little things that would affect my characters, like politics, fashion, food, religion, language, anything that might show up along the way. Those things I mostly learn online, though some books are wonderful for those details—anything by Pierre Berton is incredible. His books are non-fiction, but they read deliciously like fiction. That’s the kind of history book I relish, whereas I’m simply not good at paying attention to dry history books unless they include a specific topic I need to understand. When I go online, I quite literally dig through dozens of websites for information, whether it’s a massive point or a tiny detail, and everything is cross-checked for accuracy. Fact-checking takes a lot of time, but I have to make sure I have the right information. Telling the truth in my books is the most important rule I follow, because I’m teaching as well as entertaining. The third step is less about research and more about immersing myself in the story as if I were one of the characters. By the time all the above research is done, my characters are real to me. They are already in the midst of the story, wandering around, asking me to check out the tiniest details, like what would they have eaten on the ship heading to Dyea? What was the cost of a good sled dog in the Yukon, and how much was a horse? What kind of training did the Mounties do back then, and where? I haven’t visited Dawson City, though it’s one more place I’ve added to my wish list. A lot of people ask me if I’ve travelled to the various places I’ve written about, saying my descriptions feel real to them, which is a wonderful compliment to my research. I have only ever travelled to the locations of three of my books: Tides of Honour, Come from Away, and Promises to Keep, all of which are within driving distance for me, here in Nova Scotia. All of your recent books are set on the East Coast—why did you decide to make a change? Nova Scotia history captivated me immediately upon my family’s move here in 2008. Suddenly I was surrounded by hundred-year-old (plus) houses and multi-generational stories. To this day, many descendants of the original settlers to Nova Scotia still live on the land their ancestors’ settled. Everything about this land is picturesque and poetic. It was impossible not to write about what I felt and saw. I’m not saying I won’t write another Nova Scotian story down the road, but Canada is full of history, and I needed to expand my horizons. I started thinking about everything else in Canadian history that deserved retelling, and the first subject that came to mind was the Mounties. How much more iconic can you get than the Mounties? The trouble was, the Mounties have been working for the people of Canada since 1873, so their stories were plentiful. Which one would provide just the right background to illustrate their courage and determination? Daunted, I put that question on hold and kept my eyes open for the next story, whether it included the Mounties or not. In 2015, when I was on the cross-country Timeless Tour with the wonderful Susanna Kearsley, I happened to see a banner hanging outside the Royal Museum in Victoria, advertising their upcoming Klondike Gold Rush exhibit, and I was unable to look away. I had no idea, until that moment, that it happened in Canada, and how could I not write that story? I went right to work and discovered almost immediately that the North-West Mounted Police (NWMP, who eventually became the RCMP) were central to that story. The Gold Rush never would have been what it was without the Mounties. This was exactly what I’d been looking for. So not only did I set Nova Scotia aside temporarily, I crossed the entire country to write this story! I am presently working on two more stories, and both happen to be set in Ontario, though the one that will be coming out next spring could have happened in almost any region of Canada. It was a widespread issue, but I felt pulled to Ontario for the setting. After that, who knows? I’m hoping to write about as many provinces as possible. What makes a book great, in your opinion? What elements does a great story possess? A truly great story engages me, heart and mind. The thing about historical fiction is that it needs to fulfill two major elements, historical fact and compelling fiction, and to be done properly, neither can be more prevalent than the other. In fact, one is entirely entwined with the other. To clarify, since it is historical, we are looking at a true story as far as the featured situation goes. For example, the Klondike Gold Rush and the Frank Slide. These stories have to be fully and comprehensively researched, with as many details as possible sprinkled into the deeper facts so that everything about the events feel tangible. The black-and-white photographs we see in museums and in books must be colourized. The reader must brace against the biting cold of the Yukon and the mind-numbing whoosh of wind that came before the Frank Slide. At the same time, the reader is standing among authentic, realistic characters that the reader will get to know very well through the telling of the story. Just as with regular fiction, these characters are believable, well-rounded people with strengths and flaws that we can all relate to and identify with. They become a part of the history because they are in the midst of it, and if the characters are created well enough, the fact and fiction become neatly entwined. The characters experience those moments in history for the very first time, so the readers do as well, whether they know the historical facts or not. And if it’s done right, readers will learn so much about what happened, and they might even feel driven to research deeper. When I feel all of that, when I become a part of a story, that is the perfect book for me. It exists, obviously, in every genre, but for me historical fiction takes me where I want to go. What are you doing if you’re not writing? My favourite thing to do is write, so I do it as much as I can. I didn’t start writing until a dozen years ago, so I have a lot of time to catch up on! I always have at least three books on the go, and they take up a large part of my mind and heart. But of course I do other things. I am very fortunate to be married to a wonderful, understanding man who fully supports my writing, but who can also easily persuade me to walk away from it for a little while to enjoy other things in life. I love to be entertained, so either I am camped in front of Netflix or I am deep in a book. If I’m lucky, our daughters are with me. I love to visit museums, and now that we are older and don’t have as many responsibilities (our daughters are all grown up), I cannot wait to travel and explore new worlds. What was your favorite book to write and why? Until recently, I would say my favourite to write was Tides of Honour. It was my first Canadian historical fiction, and it was set about fifteen minutes from my home. The main character, Danny Baker, became a part of me, and I took a very dark journey through him, exploring PTSD and Danny’s battle to find and save himself. My husband teases me about how tough I am on my characters, but the truth is I feel I just follow the storyline, and it was Danny who took me there. It bothered me that growing up I had never been taught about the Halifax Explosion, the world’s largest man-made explosion before Hiroshima, and I was consumed by that tragedy when I wrote Tides of Honour. Writing it properly felt as if I was paying respect to the people who survived as well as those who did not. I have loved all my characters—though I will admit I usually connect better with the male characters for some reason. But I think Danny may have to step onto the second place podium when I finish the book I’m writing right now. You’ll see. Name your favourite bookshop in the world. I can’t. Every bookstore I walk into feels so full of promise I never want to leave. Independent bookstores are personal and fresh, and the personal care of owners and managers make them one of a kind. On the other hand, I also love walking into a huge Chapters and seeing the potential. Because of the physical size of those stores, they can carry more stock, so I can find books and series that go way back. My favourite activity over the past twenty or so years was taking my daughters into bookstores then losing them because they’d disappeared behind a shelf and were reading on their own. I feel the same sense of wonder when I walk into a library, though there’s always the nagging understanding that when I find the treasure I seek in that library, I won’t be able to keep it. I loved the Little House on the Prairie series the best. I guess that was a bit of a flag for what would become my forever favourite genre! In my teens I switched to Agatha Christie and Stephen King. Does the writing process get easier? For me, yes. I learn more about the craft with every book (At the Mountain’s Edge is actually my seventh published novel), which means I have more to work on and everything I do is deeper, so that part of the process doesn’t get easier. What does improve is how I feel about myself when I’m writing. It’s so easy for authors (me, at least) to write a book or chapter then sink into depression, convinced they have no idea what they’re doing and no one will ever, ever, ever want to read their work again. Every time I reach the halfway point of the book I’m writing, I feel a breathless sort of panic because I have no idea what happens next, but with this many books behind me and an incredible team of editors standing beside me, I have come to know I have only to wait, and the story will come. That has made my life much less difficult. I also understand now that it’s all right to cut sections out of a book if they don’t fit. I research and write a ton, but if it’s not supposed to be there, if it doesn’t suit the plot, then it has to come out, even if it’s a favourite scene. I never completely delete those sections though, because I believe whatever I write, it was written for a reason, and sometimes I’m able to mine deletions from earlier books and use them in more recent ones. We’re always on the hunt for our next great read. Recommend a book to add to our TBR pile! So many great books out right now! In historical fiction, I would highly recommend Pam Jenoff’s The Lost Girls of Paris (as well as her earlier The Orphan’s Tale); I loved A. J. Pearce’s Dear Mrs. Bird, and Juliet Blackwell’s The Lost Carousel of Provence. For women’s fiction, I suggest anything by Marissa Stapley—like her upcoming The Last Resort—and I really loved Roz Nay’s Our Little Secret.